As one of Westchester County, NY's leading independent home inspection and environmental testing providers, we are dedicated to the safety, health, and comfort of your family! 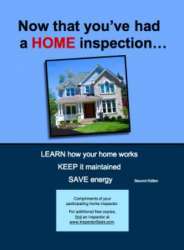 Inspection services are a great investment whether you are buying, selling, or planning to stay in your home. Most home owners find that our suggestions make their homes more comfortable, safer to live in, and healthier for family and guests. Our annual home reviews provide you with a "working list" of items that should be maintained on your home. Our testing services help confirm whether or not action is necessary at all. Everything we do is geared to making your home environment a healthier and safer place for you and your family. Believe it or not, most homes have many potential hazards that can be dangerous. Left uncorrected they may be deadly! Most common hazards can be easily corrected at very little cost; many at no cost! Our experts will show you where problems exist, and in many cases, how to fix the problem yourself. They will also recommend when it may not be a good idea to "fix it yourself" and call in a Professional.